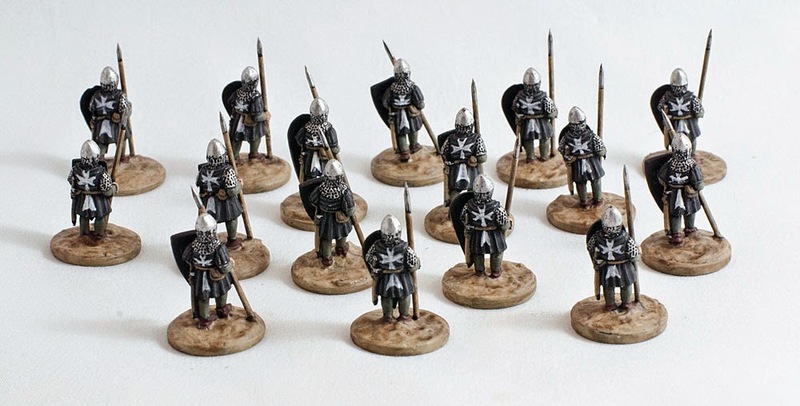 I have been working on a band of Hospitallers for Saga: Crescent & Cross. This is a project I've been talking about for a while. My wife, Grace, and I both planned to paint up forces, but it took us a long time to decide if we were going to do it in 28mm or 15mm, and then what warbands we wanted to build, where we would get our figures from, etc. We both actually bought 28mm forces (Fireforge Templars and Mongols) before we decided to do it in 15mm after all. In the end, we put in a big order to Legio Heroica miniatures in Italy, with our friend Dave ordering a batch as well. Grace and I have been diligently painting our figures since we got them just before Christmas, and we both got quite a bit done over the holiday. Here's mine. Two units of foot Warriors. Two units of mounted Seargeants (Warriors in Saga), plus some sort of leader-type. With these guys, I tried something different than what I have done in the past: instead of painting the metal parts with metallic paints, I just scraped and filed off the primer to expose the bare metal of the pewter miniature beneath. The result is that the metal is really shiny and bright, much nicer than anything I could expect with the paints, if that's the effect you want. The effect is diminished by the Dullcote I always use, but a bit of gloss varnish on the metal bits brings it back. The Sergeants come with pewter spears, which aren't bad in their own right, but I elected to add some wire spears. I think they look a lot nicer, and they are properly stabby - I have poked myself a dozen times already. I was torn about whether I should order some Little Big Men transfers for the shields, but decided to just freehand them. It's a lot of work, but I think they worked out fine. The Legio Heroica figures are really nice, maybe the nicest 15mm figures I have seen (though there are so many great choices out there, it's a tough field). Wow! Splendid and most impressive job, love them! You've done a great job on these and have enjoyed your dark age posts also, keep up the great work, Just followed your Blog. Great work, the freehand shields are stunning! Interesting trick about the metal, I have to try this some time… I'll also follow your blog, very nice stuff here, love the pictish village & of course the Quar! Thanks for your comments chaps! The metal trick is actually a lot more effective than what the photos show. The metal parts are noticeably brighter this way.